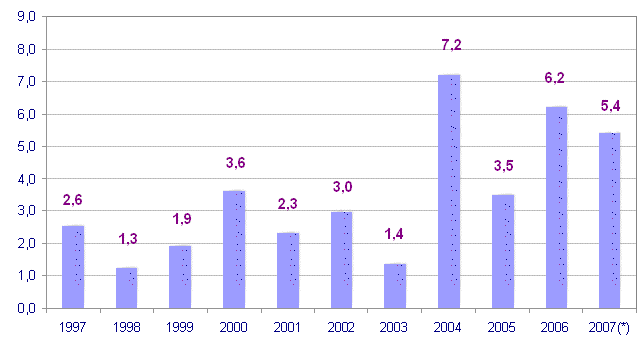 Over the last twelve months (January 2007 on January 2006) construction costs increased by 5.4%. The Construction Costs Index of the A.C. of the Basque Country increased by 2.2% in January 2007 with regard to the previous month, which meant the inter-annual rate for the month came to 5.4%, according to EUSTAT data. In January 2007 labour costs increased by 3.5%, while raw material costs also increased by 1.6%. The subsectors Building registered 1.7% growth in raw material costs with regard to the previous month, while Civil increased by 1.0%. The inter-annual evolution of these two subsectors shows that they follow slightly different trends: raw material costs of Building grew by 6.7%, while raw material costs of Civil Works accumulated 5.0% growth. In January the highest growth in prices corresponded to raw materials consumed by Artificial cement (5.8%), Lime, gypsum and plaster (3.9%), Paint and varnish (3.7%), Glass (3.4%), Mining Arids (3.3%) and Articles derived from cement (3.0%), among others. By contrast, there was a reduction in the prices of raw materials for Oil By-Products (-5.0%), Asphalt products (-3.0%), Cleaning and hygiene material (-2.7%), Electric appliances and material (-0.8%) and material Metal piping (-0.1%). Among the prices of raw materials consumed by the sector that registered the highest inflation over the whole of the twelve months were: Iron and steel (21.8%), Electric energy (21.2%), Metal piping (18.4%) and Glass (15.2%). In addition, there were reductions in inter-annual prices (January 2007 on January 2006) for the raw materials used by Oil by-products (-12.5%), Asphalt products (-7.9%), Cleaning and hygiene material (-2.1%) and Ceramic products (-0.1%).